Vancouver-based developer Onni Group has revealed its latest plans for the stalled Colwood Corners project at Sooke Road and Goldstream Avenue. Ummmm...."ugh"? Certainly hope this is an early days rendering and nothing more. While its great that something is finally happening here on first blush to be charitable this isn't terribly fetching. What is it with so many proposals locally that insist all buildings be the same height? Bad enough everything needs to be the typical Victoria garden-variety 4-6 stories but when you get a cluster of structures like this what is with the resistance to incorporating at least some variation in height and style? The only descriptors that can come to mind with this iteration are......dull, boring and uninteresting. ...Certainly hope this is an early days rendering and nothing more...The only descriptors that can come to mind with this iteration are......dull, boring and uninteresting. I think this is basically what we're going to see with the first phase. I do believe there may be opportunities to revisit the scale and nature of future phases, but that's all market driven. You're right, it's probably just a phase. We shouldn't let it faze us. I don't understand; are they demolishing the existing foundation or building a different project using the same footprint? Edited by Rob Randall, 30 June 2016 - 02:11 PM. When you look at the constant resistance thrown at developers to get approval for anything of significant height and couple that with the cost savings by building wood framed structures allowed up to six stories, it is easier to understand these proposals. 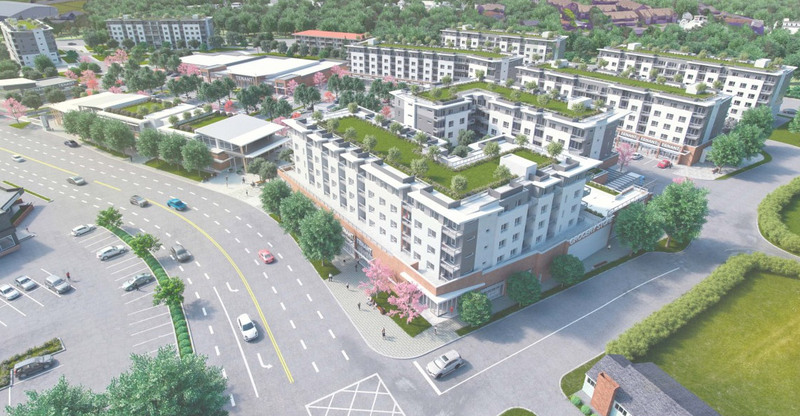 Developer Onni Group has resubmitted its development plans for Colwood Corners and the project has a clear emphasis on pedestrian access, variety and a green environment. According to the City of Colwood’s website, improvements to the character of the buildings include a variety of facade elements, such as colours and materials and a variation of roofline angles and treatments. Edited by snub, 26 January 2017 - 02:11 PM. Sounds promising. At least heading in a better direction than luxury condo towers here. More family friendly density is much more appropriate and what we are short of. Yeah dasmo, I think this is looking pretty good. This looks more reasonable and like something that might actually get built. Goldstream article on this development. City of Colwood staff are recommending that council approve a parking variance application from Onni Group that would move the Colwood Corners project one step closer to construction. The variance would allow for a relaxation of the municipalities' parking requirements which are widely seen as dated. A staff report outlines that they are stricter than other municipalities in the CRD, higher than industry standards for suburban and commercial development, and ignore access to other forms of transportation and the effects of a viable shared parking system. We could do with a lot more of that. One move would be to scramble parking. If I coke home to my rental apartment at 10pm and I can not find a space underground, I just park up in he commercial surface spaces. When you're in that state you are rarely home before 4 am. You beat me to the punchline on VHF's "Freudian slip". Onni Group personnel have begun preliminary work on the site of the Colwood Corners development, although full-blown construction isn’t likely to begin until the later this year and a building permit still needs to be secured. They still haven't decided if they are going to drain the pool or tear it down. The on again off again project destined to change the face of Colwood is finally set to forge ahead. The Onni Group, developer of the Colwood Corners project, announced today that site preparation work will begin in mid-August for the commercial and residential project that will feature 471 residential units. The first phase will consist of three mid-rise residential buildings and 152,000 sq. ft. of commercial space that will feature four anchor tenants, including a major grocery store, said Rodney Rao, development manager for the Onni Group.